Sadiya Naseem did her Bachelor’s degree in Communications and post graduation in Journalism and mass communications from Aligarh Muslim University. Later, she went on to pursue Senior Management Program in Strategy and leadership from Indian Institute of Management, Calcutta. 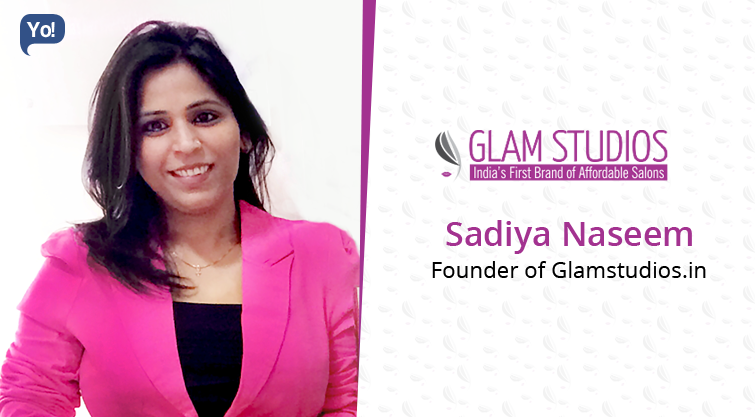 A true entrepreneur at heart, Sadiya realized the need of quality services at affordable rates in beauty salon industry segment.After finding out that there was no brand operating in the budget segment, she conceptualized GlamStudios, which is a tech-driven brand of affordable salons. GlamStudios is a tech-driven brand of affordable salons. We aggregate and upgrade the existing budget salons through technology, training, processes, rates standardization and bring them under one brand. We offer predictable experience at unmatched price points to our customers. I always wanted to start my own venture and was keen to do something for beauty and wellness industry. Because as a customer I always felt the need of quality services at affordable rates but unfortunately there was no brand operating in the budget segment even though the industry is growing at a rapid pace. As result 75% of the salons are still unorganised and I am sure with Glam studios we will be able to organise this segment and make the standardised services available at an affordable cost to the woman next door. Spend quality time in anything you do rather than running behind hours. Manage your time, money and people well! Every entrepreneur faces challenges while making his/her dream a reality. The sense of achievement motivates them and the fire in the belly keeps them going in all the highs and lows. For me the most challenging task was to acquire our first salon on our terms and conditions. Staying positive in every situation gives our minds strength to overcome any challenge. I always remained positive and kept on working hard and that really helped. We got seed funded from our advisor Aqeel Ahmed, Ex COO Rategain Technologies. The funds are mainly being used in activating more supply, building technology and creating a base of 5000 customers by the end of June 2016. At present we are looking to raise another round and should be closing it soon. Fortunately, the team at Glam is very excited about the company and its growth and shares the vision of all the founders. At the senior position, we always hire people who take a minimum cut of 30% on their existing salary and join us for the value they see in the company rather than their monthly take home. When it comes to junior profiles we keep them motivated with exciting incentives both in the short and long run. If you dream of something don’t wait! I am working along with the team to make GlamStudios, the largest chain of salons operating in the budget segment across the Globe. We aim to bring 2000 salons under our brand by 2019. Winners don’t do different things they do things differently!